Beyoncé has launched Rise Sheer, a new perfume for women. Rise Sheer is a "fresher" flanker to 2013's Rise. The notes feature bergamot, lemon, iced basil sorbet, Gold Symphony orchid, peony, jasmine, blonde woods, sheer musk and amber. 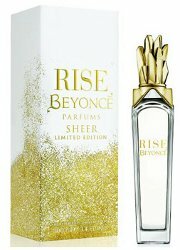 Beyoncé Rise Sheer is available in 100 ml Eau de Parfum. Something about ‘iced basil sorbet’ sounds good to me. Maybe not so much the sorbet part, as that says sugar to me. That top reminded me of McDonald’s fries, at least from that photo. It sounds good to me too, but admittedly can’t remember if I ever smelled the original (it had the basil sorbet too). I see McDonald’s fries too, lol. Say that name “Rise Sheer” ten times fast, I can’t! Then I’m sure I can’t! I’m finding that spiky-looking cap really ridiculous. Some toddler’s going to lose an eye, grabbing it off his big sister’s dresser. Has anyone tried any of the Beyoncé fragrances and liked it? I am a huge fan, especially since she’s from my hometown (Houston, TX). Just wondering if the scents are powerhouses like the entertainer. Not really liking the bottle, but the box is exquisite!